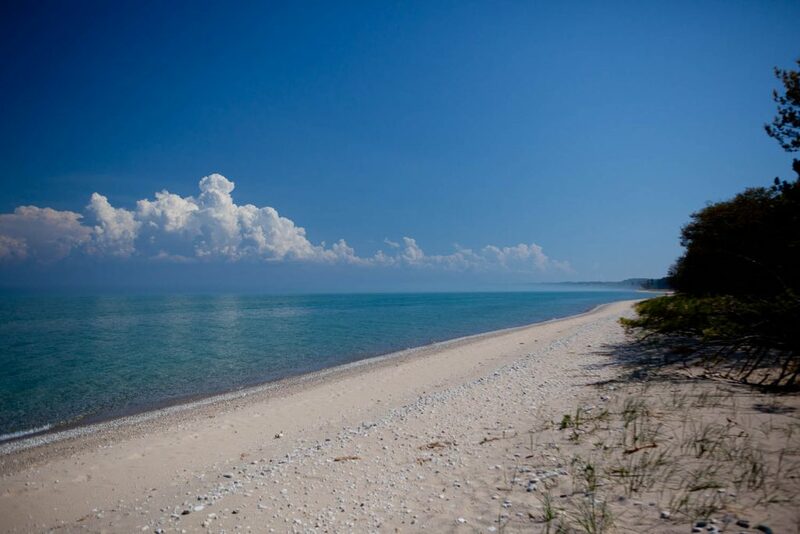 Anxious to get outside, I decided to go on another backpacking trip to N. Manitou Island. This one – in the spring. I’ve been to the island few times, but it was always in the fall. This time I only found one person interested in going with me. So there were only two of us going. 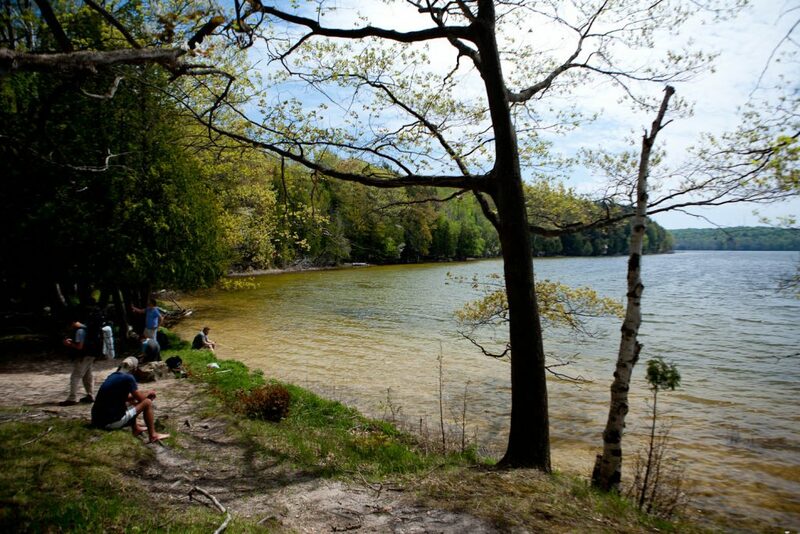 We drove to Traverse City on Thursday, after work, and camped in Traverse City State Park. Hikers waiting for the ferry. On Friday morning, we left the campground at 6:45AM and drove to Leland. We had plenty of time to have breakfast at Early Bird, register and get ready for our 10:00AM ferry ride. It was Memorial Day weekend, and there was quite large number of people going to South and North Mantiou Islands. It was hard to tell who was going where. There were only few people with heavy camping gear, that gave them away as most likely going to the south island. The ferry was full. We tried the open upper deck, but the swarms of midges were horrible there. So we moved back to the enclosed lower deck. Since the lake is still very cold, seating outside would be fairly cold anyway. 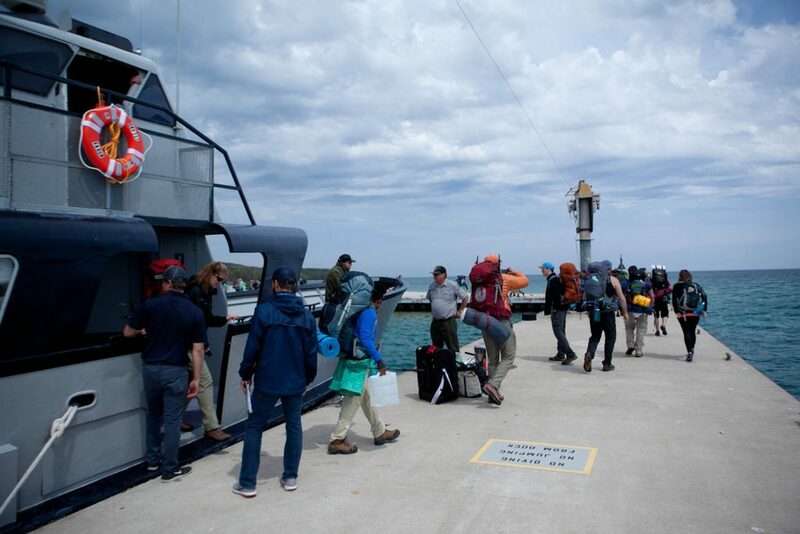 The ferry was first going to the South Manitou Island. The lake was fairly quiet. We passed close to the North Manitou Shoal Lighthouse. More than half of the people disembarked on South Manitou, and we only took few new passengers from there. Soon, we were on our way to the north island. We were anxious to get out and on the trail. 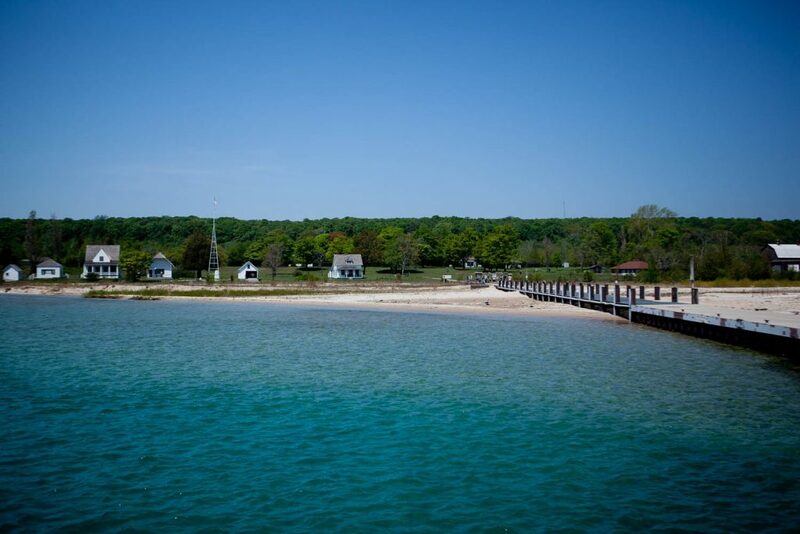 Finally, we got to the North Manitou Island dock at 12:30PM. At the North Manitou Island dock. After short orientation provided by one of the rangers, we were finally on the trail. Since every time before, we visited the southern part of the island, this time, I decided to hike the northern trails. We took the trail going to Apple Orchard and then to Lake Manitou. 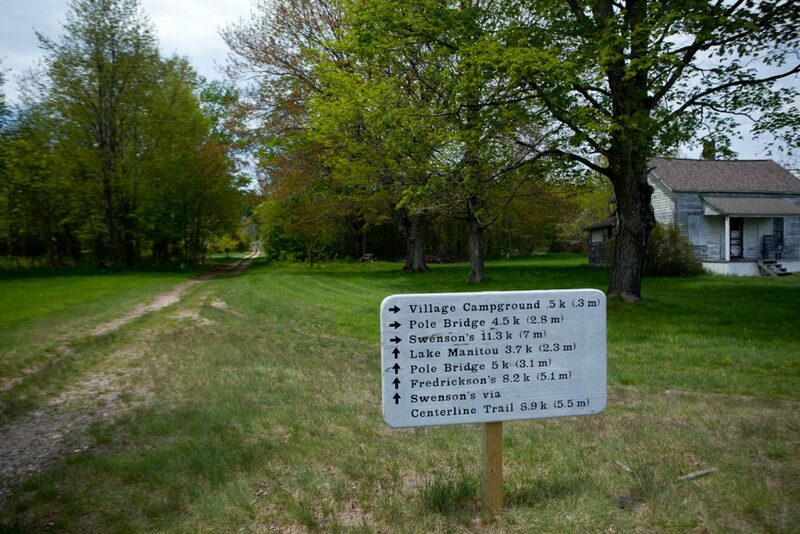 Trail sign in the Village. The spring on the island was almost as advanced as it was in Detroit area, which was surprising. I expected it to be behind by about two weeks due to northern location and being surrounded, by the cold at this time, Lake Michigan. Everything was bright lush green. Trillium was blooming everywhere. 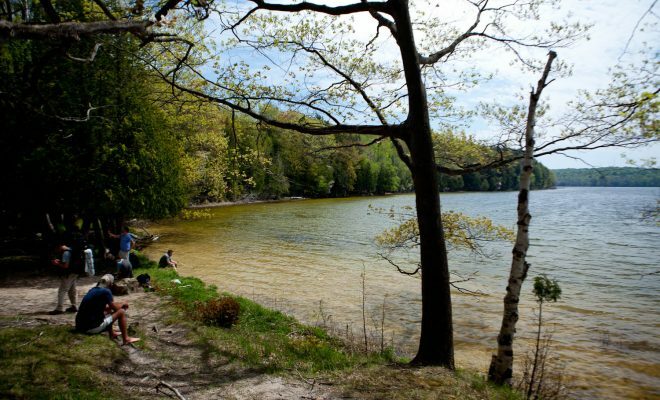 Once we got to Lake Manitou, we followed, not shown on the map, so I would guess – unofficial trail along the lake till we got to Fiskes. “Unofficial” trail along Lake Manitou. It was my first visit to Lake Manitou. The lake is beautiful, and definitely worth stopping by and even spending a night there. There were few groups of backpackers camping there. After short stop, we hiked towards Bennon’s Place to get back on the main trail. Form there, we continued north towards Pole Bridge. From there, we took it west to Stormer Camp. This is the location of a graveyard of some of the logging trucks used on the island in the early 1900’s. It must have not been worth moving them back to the mainland, once the logging operations stopped. After checking out the rusting automotive remnants, we took a break to snack on some granola bars and trail mix. 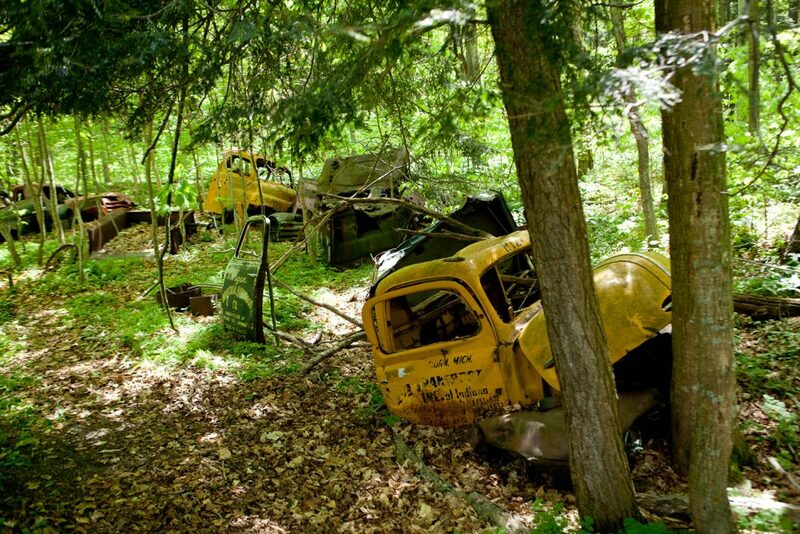 Rusted logging trucks at Stormer Camp. Soon after, we were back hiking towards Swenson’s Barn on The Old Grade trail. I planned on camping somewhere before, along the shoreline. 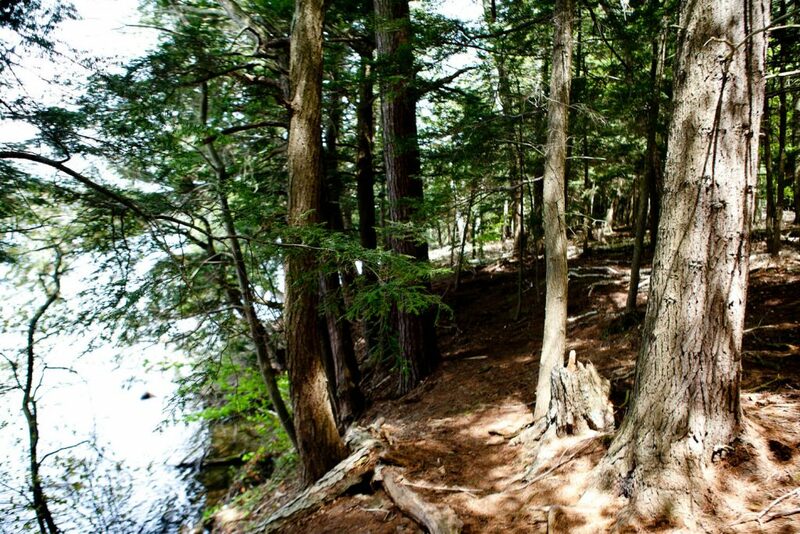 When we got close, we took the first trail leading towards the lake (not on the map, again). Once we hiked over few dunes, we followed the shoreline till we found suitable camping site. There were quite few other camping parties around. Luckily, not too close to us. 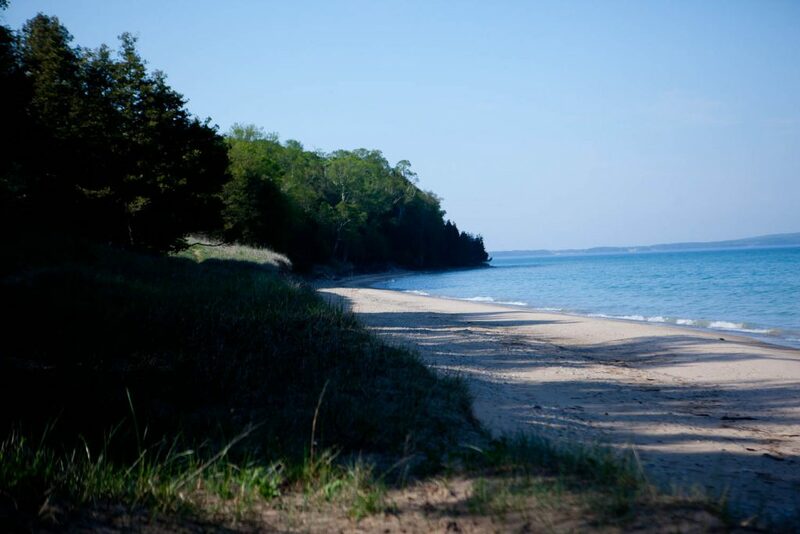 Camping on North Manitou Island. Today, we covered probably about 8 miles. The trail was easy. Mostly flat. 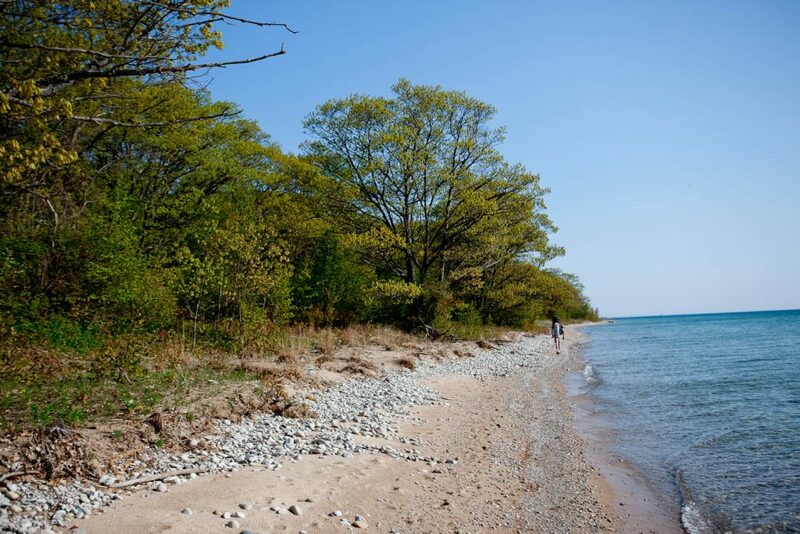 There were only few hills on the trail following the Lake Manitou shoreline between southern tip of the lake and Fiskes marker. It was only 5:15PM. Plenty of time to setup our tents, cook and eat. Then we had time to relax on the beach. The weather was great whole day. We had full sun most of the time and the temperature was in high 70s to low 80s. On the beach it was a little cooler because of the cold breeze coming from the lake. We did not get a chance to watch the sunset though. About an hour or so before, the clouds began to build up along the western horizon. There was a storm in the forecast coming at night. Sure enough, around 11PM, the rain and occasional lighting began and pretty much lasted till early morning hours. When we emerged from our tents, the sun was up. It was another bright and sunny day. The sandy ground was fairly dry, and only the wet tents and occasional drip from a tree reminded us of the night rain. We did not have to hurry. Today, we had only short hike to South Cherry Orchard and then south. So total of maybe 5 miles. We took our time cooking, eating and packing, but still by 9:15AM, we were ready to hit the trail. 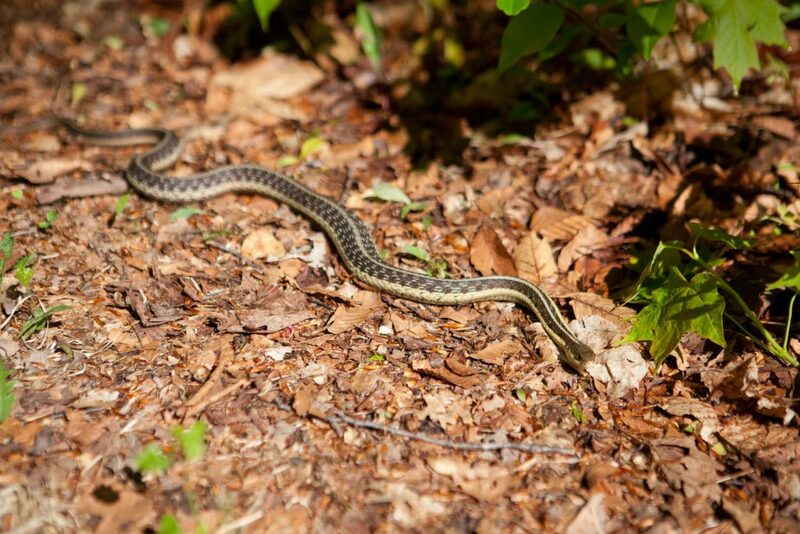 Common Garter Snake – quite a common sight on the island in the spring. We hiked through to South Cherry Orchard. There we turned south. Soon we ran into a huge camping party, with a lot of heavy gear setup not far from the shore. I was wondering how they got the gear there. And later we found out that they came on a private boat, which was moored offshore. We continued south for about a mile till we found what looked like a footpath leading towards the shore. We took it and after about five minutes got an empty opening in the woods by the shore. It looked like a perfect spot to camp. The only issue were deer droppings all over. But after looking around, we found clear spots to setup our camp. It was still very early. I would’ve spent more time on the trail. 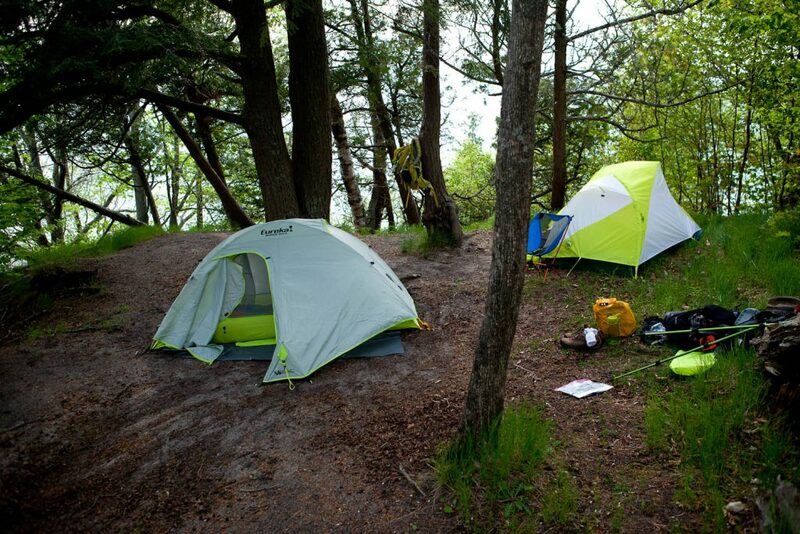 Take some breaks in hiking and not getting to the campsite this early. However, my backpacking partner, new to backpacking, was anxious to move as quickly as possible. And also anxious to get to the next camping spot. So we ended up here at noon. After setting up, visiting the beach, eating lunch, we decided to take a nap. I waked up around 3:00PM. My buddy wasn’t in his tent. I found him at the beach. There was a strange fog building up along the mainland and coming to the island. We watched it for long time, while it was engulfing the shoreline around us. Fog building up around the island. After sitting for long time, I’ve decided to go for a walk, and hiked for about a mile north along the beach and then back. I was looking for Petoskey stones, without any luck. Finally, around 6PM, we decided to cook dinner. The temperature began to fall, and it was relatively chilly at the beach. I say, relatively, because it was still pretty mild. However, with having temperature in high 70s during a day, when it dropped down to low 60s or high 50s, it felt cold. Beach along the eastern shoreline of the island. We were forced to our tents by light rain that began around 8PM. It rained on and off for about two hours. At one point, I have finally fallen asleep. About 1AM heavy rain and thunderstorm waked me up, and I did not get much sleep till it was over around 5AM. We were lucky with the weather. When we got up in the morning, the sun was shining, and the sky was clear. Again, we had plenty of time. We had only two miles to hike to the dock, and had to be there by noon. So, we took our time drying the tents, eating breakfast and packing, but still we got ready to leave by 9AM. Hiking to the dock, we did not go back to the trail, but instead followed the beach to the Village area. We got there around 10AM, and had two and half hours to kill before expected arrival of the ferry. Hiking back to the Village. The ferry did arrive on time, at 12:30. There were more people going back than arrived with us on Friday. After and hour ride, we got to Leland, and another great trip to the island ended. 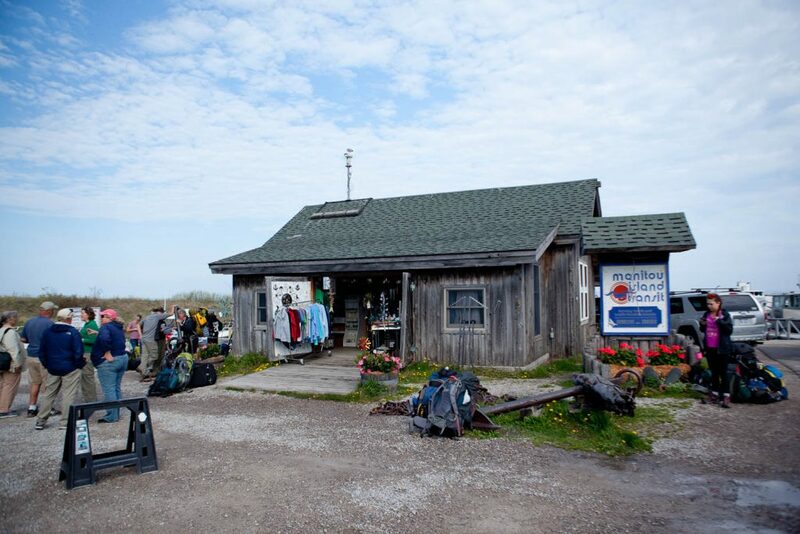 Hikers waiting for the ferry on North Manitou Island. In summary, I have to say, that we very lucky with the weather. It was perfect, with gorgeous, sunny days, and rain only at night. In the spring, you need to expect some rain there. It could also be cold at times. We had the highs of low 80s during the day, and lows of mid 50s, at night. The bugs were not bad. Only some mosquitoes were present at time. But not annoying to the point that I would have to use the bug spray (which I hate). They were mostly present in some low spots in the woods. In our camping spots, at the lake, we had to deal only with few here and there. 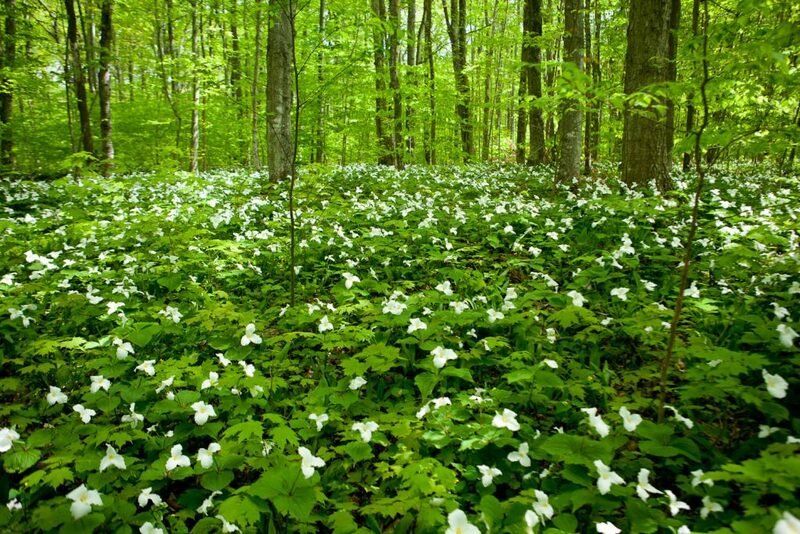 Overall, when comparing the spring and fall hiking on the island, I would say, I prefer the spring because of the lush green, waking up nature. The drawback, though, is that you cannot jump into the lake. With the temperature around 40 degrees, it is just too cold. Because of Memorial Day weekend, I was expecting crowds, but it wasn’t that bad. Maybe it was because we offset it by a day, going to the island on Friday morning and coming back on Sunday afternoon. I would have to say, that the amount of people was only slightly greater than during our mid-September trips.